NO CHILD SHOULD GROW UP HUNGRY IN AMERICA. But 1 in 5 children struggles with hunger. Share Our Strength's No Kid Hungry campaign is ending childhood hunger in America by connecting kids in need with nutritious food and teaching families how to cook healthy, affordable meals. You can help surround kids with healthy food where they live, learn and play. 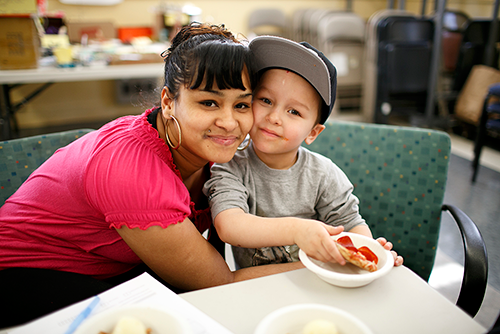 As part of the No Kid Hungry campaign, Cooking Matters programming helps families throughout Massachusetts learn how to stretch their food budgets so that kids are getting healthy meals at home. Make a tax-deductible gift to support our work specifically in Massachusetts and you will enable more families to learn how to shop smarter, use nutrition information to make healthier choices, and cook delicious, affordable meals. $35 supplies the class materials for a Cooking Matters course. $50 provides a participant with a grocery bag of ingredients each class. $100 pays for the $10 Grocery Tour Challenge for ten families. $250 provides measuring cups & spoons for 100 graduates. $5,000 underwrites a 6-week course.